Paul Yarossi, president of HNTB Holdings Ltd., in New York City is the sole recipient of the 2013 “ARTBA Award”—the association’s highest honor. 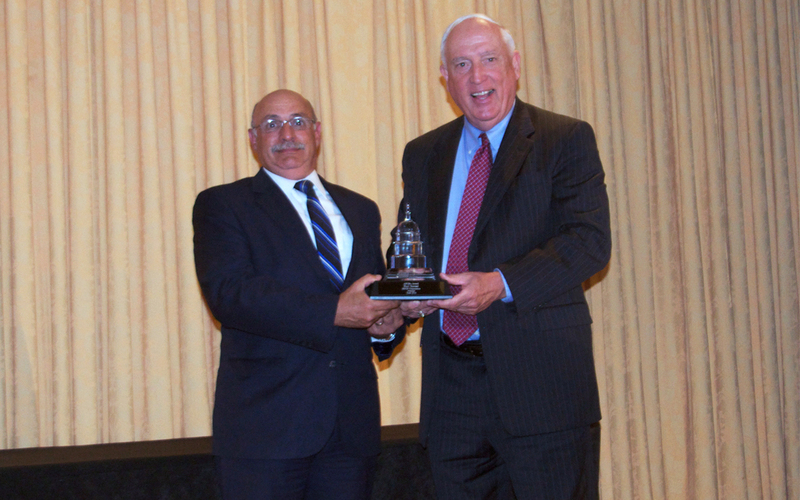 It was presented at a June 10 luncheon during the ARTBA Federal Issues Program in Washington, D.C.
Yarossi was honored for his more than 40 years of work in the industry. He first joined HNTB, one of the nation’s top engineering, architecture, and construction management firms, in 1973 after graduating with a civil engineering degree from Manhattan College. He directs the firm’s governance, capitalization strategy, compliance and audit functions, as well as its external and government relations. He has also been instrumental in formulating the firm’s training and development programs. Yarossi’s leadership positions in ARTBA over the past 15 are long and distinguished: chairman of the board, senior vice chairman, first vice chairman, vice chairman at-large, chairman of the Transportation Design & Construction Innovation Advisory Committee, co-chairman of the ARTBA SAFETEA-LU Reauthorization Task Force, and a trustee of the ARTBA Transportation Development Foundation. Previously, Yarossi held key leadership roles with the Council on Competitiveness, the U.S. Chamber of Commerce “Let’s Rebuild America Leadership Council,” the Design Professionals Coalition, and the American Council of Engineering Companies.